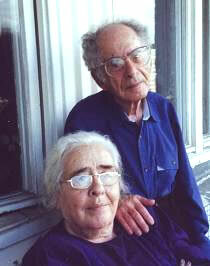 GRIGORY SOLOMONOVITCH POMERANZ and ZINAIDA ALEXANDROVNA MIRKINA. P. was born in the town of Vilno on March 13th 1918. Philosopher, culturologist and publicist. An author of numerous philosophical works that circulated in samizdat and made a great impact on the views of liberal intelligentsia in the 60-s and 70-s.
At the age of seven P. moved to Moscow. In 1940 graduated from the Institute of Philosophy, Literature and Art (IFLI) majoring in Russian literature. Studied Dostoevsky. Being a student P. wrote a paper on Dostoevsky that was labeled anti-Marxist by his professors. His PhD was destroyed after his arrest in 1949. In 1941 P. voluntarily went to the front. Was wounded. In 1950 sentenced to five-year imprisonment and sent to Cargopollag. In 1953 released due to general pardon. In 1958 rehabilitated. From 1953 to 1956 worked as a village school teacher in Donbass. On return to Moscow got a job of a bibliographer in the Library of Public Sciences (FBON). In 1959 his first wife, I.I. Muravieva died. Her memory inspired philosophical and literary works by P. for a long time. His first essays (Abstractions Overcome) composed in a traditional form of a philosophical dialogue and still arranged with contemporary realities of Stalin labor camp were written in the period between 1953 and 1959. The Hungarian events of 1956 and a hunt for Pasternak shocked P. to the extent that he started considering a straight political resistance to the regime including his possible participation in the armed revolt if necessary. In 1959 – 1960 P. led a semi-secret seminar on philosophical, historical, political and economic issues. The seminar was attended by V. Osipov and other activists of Mayakovka-group. Encounters with A. I. Ginzburg, N. E. Gorbanevskaya,Y. T. Galanskov, the editors of Sintaksis and the painters of Lianozovo-group that took place in 1960 gave P. a new perspective and a new hope – activities free of any censorship and fear. In 1961 P. met his future wife – poet Zinaida Mirkina. As P. himself puts it: « My views and Zinaida Alexsandrovna’s views have always influenced each other and should be regarded as the whole». Since 1962 P. has been publishing his articles on Oriental studies and comparative culturology, his main interests being spiritual life in India and China. He began giving reports and lectures in various research centres and universities. He also wrote a number of essays on cultural, historical and social topics. These essays had a broad circulation in samizdat. The two of them ( A Quadrillion and The Moral Make-up of a Historical Figure ) printed in Y. Galanskov’s Phoenix-66 were especially popular. In 1967-1968 both of these essays were reprinted abroad in the magazine Grani. P. had close ties with dissidents of various wings and participated in underground seminars. In 1970 he attended the seminar held in V. F. Turchin’s flat. Academician A.D. Sakharov writes about this seminar in his Memoirs: «The most interesting and deepest reports were given by Grigory Pomeranz – it was the first time that I met him and was greatly impressed by his erudition, breadth of views and «academic approach» in the best sense of these words. His main conceptions are the following: an exceptional value of culture created by joined efforts of all nations of the West and the East throughout centuries; the necessity of tolerance, compromise and breadth of mind; wretchedness and poverty of any dictatorship and totalitarianism, their historical fruitlessness; wretchedness and futility of any nationalism and chauvinism». In 1968 P. put his signature under The letter of 224 in support of Appeal to the World Public Opinion by L.I. Bogoraz and P.M. Litvinov in defense of Ginzburg and Galanskov. As a result P. was deprived of any opportunity to defend his thesis at the Institute of Asian Countries. In 1972 a separate edition of the works by P. (The Unpublished) came out in Munich. In 1976 they stopped printing articles by P. in Soviet editions. Still his works were widely published in samizdat and reprinted in western émigré press (in the magazines Continent, Sintaksis, Strana I Mir. In the second half of the seventies P. cooperated with the editors of samizdat magazine Poiski and published his new essays in this magazine. He always signed his works with his own name and never used pen-names. In his essays on political and social issues P. stands up for personal liberty and European democracy. He opposes idles of «blood and soil», the new wave of nationalism. His consistent and energetic defense of these principles made him one of the most prominent fighters against the conservative trend in dissident movement. For many years he was involved in polemics with A.I. Solzenitsyn. P. strongly criticized Solzenitsyn’s «passionate narrowness», his vindictive and intolerant spirit as well as his chauvinistic Utopism. Disagreeing with Russian nationalists P. was close to human rights activists. Political and social articles by P. as well as his public conduct attracted KGB’s rapt attention. On November 14th 1984 P. was officially warned (the Decree of 12/25/1972) in connection with his publications abroad. On May 26th 1985 KGB agents searched his flat and confiscated his literary archive. The same year the full text of The Dreams of the Earth was printed in Paris. Since the late eighties numerous social and political essays by P. have been printed in Russian periodicals; a number of books on philosophy and literary criticism has also been printed. P. has been giving reports and lectures in various places including Russian State University for The Humanities and University of the History of Cultures. P. thinks that in order to put an end to spiritual and political crisis of our time Man should get rid of pseudoscientific ideologies. «To get out of a quagmire we must find a new spirit in our own depth. This is what I am actually talking about in all my books». Was born on January 10th 1926 in Moscow. Went to a Philological Department of Moscow State University. Before the defense of her diploma paper was paralysed and spent five years in a state of immobility. Since 1955 M. has been publishing her translations of poetry from German (Rilke) and languages of peoples of the USSR. She has not published her original poems or essays on religious and philosophical issues since 1990. In 1988 M. joined a group of spiritual poets «To Your Name». Married to philosopher Grigory Pomeranz.